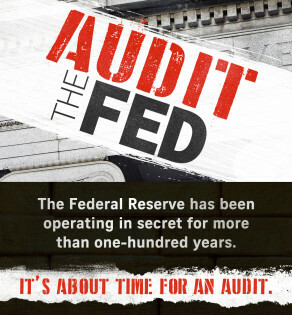 "Tell Congress: Audit the Federal Reserve!" Tell Congress: Audit the Federal Reserve! Rep. Thomas Massie (R-KY) and Sen. Rand Paul (R-KY) have reintroduced former Texas Representative Ron Paul’s “Federal Reserve Transparency Act” word for word. "The Fed's operations under a cloak of secrecy have gone on too long and the American people have a right to know what the Federal Reserve is doing with our nation's money supply," Sen. Paul says. "Audit the Fed has significant bipartisan support in Congress and across the country and the time to act on this is now." The Act would force the Federal Reserve to undergo a full audit and have the findings reported to Congress -- the part of government responsible under the Constitution for money and "the Value thereof." (US Constitution, Art. I, Sec. VIII, Cl. IV). Take action! Complete the form below to proceed to send messages to your U.S. Representative and Senators -- demand that they pass the Federal Reserve Transparency Act and place it on Donald Tump's desk in 2017!